Orson Welles considered The Magnificent Ambersons the crucial turning point in his career. He said, "They destroyed Ambersons and it destroyed me." In 1942, while Welles was away, RKO Studios drastically recut the completed film. None of that deleted footage is known to survive. 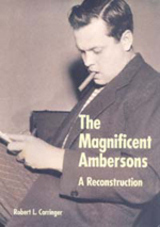 Now film scholar Robert Carringer has reconstructed Welles's own version of Ambersons, using all available surviving evidence including rare studio documents and the recollections of Welles himself and other original participants in the film. Carringer reaches startling conclusions about where the responsibility for the film's undoing ultimately lies. His spellbinding—and no doubt controversial—book will be eagerly welcomed by film historians and enthusiasts. Robert L. Carringer is Professor of English and Film at the University of Illinois, Urbana-Champaign, and author of The Making of Citizen Kane (California, 1985).